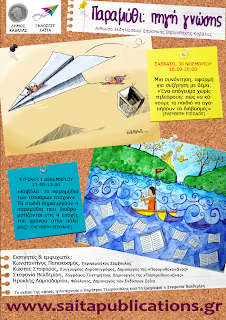 The Municipality of Kavala and Saita Publications invite you for a weekend dedicated to the love for reading, development of the imagination and cultivation of creativity on the occasion of the fairytale, in the event hall of the Public Library. On Saturday the 30th of November, from 18.00 to 20.00, parents, kindergarteners and educators by participating on the discussion with the topic: “An afternoon without television: how to make children love reading?” they learned, amongst other things, creative ways of preoccupation for children through the books from Saita Publications, practical advice on how to sensitize children on reading and discovering the “Magic Card Deck of fairytales”. On Sunday the 1st of December from 11.00 to 13.00, Elementary and High School students will learn unknown aspects of local history, and create their own fairytales about Kavala, one for each season of the year. It is addressed to parents, educators and kindergarteners. Students, who will have the opportunity to create their own magic card deck, are welcome to the event. One the occasion of these fairytales, and with the help from the Magic Card Deck of fairytales, and inspired by the history of Kavala, together with the children we created four fairytales which take place in the four seasons of the year in the city.